Painted and artificial lawns: The long summer drought led to plenty of watering restrictions and the rise of drought-shaming. For those who still want a green lawn but don't want to risk neighborhood snickers, artificial lawns or ones that are painted green offered a dose of green without the guilt. Decomposed Granite: As more and more people switched to rock gardens, California native plantings, or just gave up the lawn entirely, this filler was everywhere. Combining it with pavers, drought-friendly plants and tasteful statuary takes this look from basic to luxe. Perennial Grasses: Another trend springing from drought-conscious landscaping was the rise of the use of native grasses. Instead of manicured and maintained lawn, the landscape is a bit untamed, planted and left to mature and roam wild. Call it the garden equivalent of beach hair, a lot of front yards were sporting the uncombed look this year. Bringing In The Tech: People are still investing in adding outdoor living spaces to their backyards and more than ever technology plays a role. Wifi and surround sound are a must as are LED lights and televisions, especially poolside. Netflix and chill just took on a whole new meaning. What is coming for next year? Look for the "internet of things" to move into the backyard with devices that talk to each other and let you know when they require maintenance. 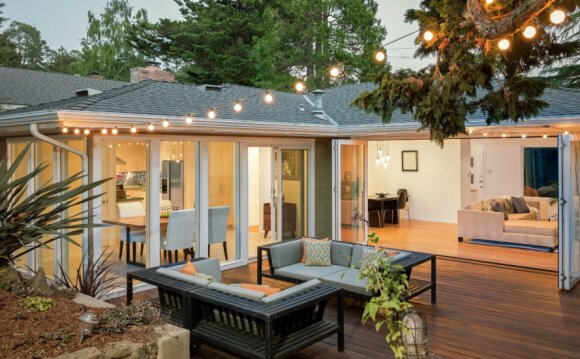 If the backyard has become the new living room and kitchen in recent years, look for its next iteration to be as the home office and entertainment area.